In my latest post I wrote about three wonderful days we spent in Marsala, a town renowned for its wine, and as we discovered, also for its baroque architecture, delicious sweets, and ever-present sea breeze. 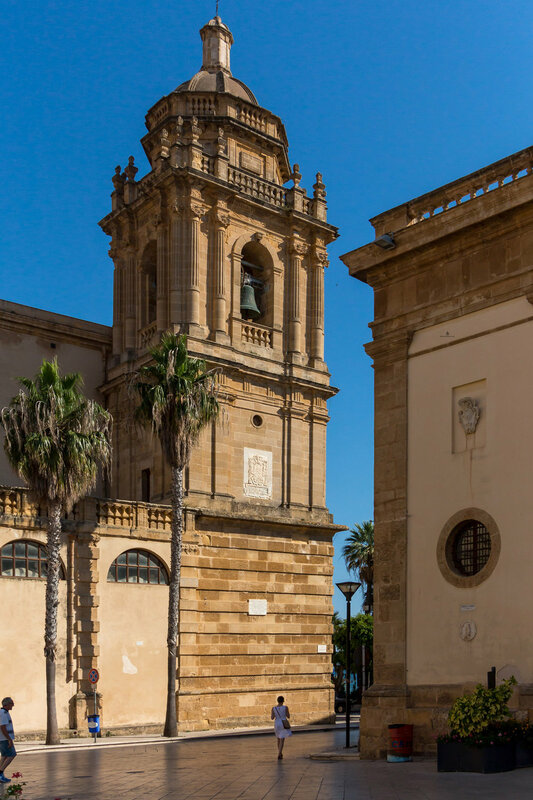 Since we are the kind of travelers that can't stand still, while we were in Marsala, we also visited the nearby town of Mazara del Vallo, a beach and a restaurant in Porto Palo and the port town of Trapani. Mazara del Vallo was known to me mostly as a place where delicious Sicilian red prawns come from (gambero rosso di Mazara). Reading about Mazara, I found out that it is home to the largest fishing fleet in Italy, that it was governed by the Arabs in 9. and 10. century, and today's old center called kasbah still retains Arabic urbanistic influences. Mazara is about half an hour drive from Marsala and makes for a perfect day trip, unless you're visiting on the hottest day of the season (like we did), and have to spend most of your time taking shelter from the sun. The kasbah is a peculiar neighborhood, with its irregular, narrow streets, and colorful tiles adorning the houses and the walls. North of the kasbah, there is a Baroque church of San Francesco, with an interior so lavishly decorated that it reminded us both of creamy wedding cake decorations. Next door, a nice older gentleman invited us to see the collection of model churches of Mazara made by himself. There were at least twenty of them, and I am always surprised to see just how many churches you can find in a small Italian town. Italy really is an open-air museum. We took a walk to the main square afterwards, had an ice cream in the shade, and unfortunately were so beaten down by the sun that we both agreed on heading directly to the beach of Porto Palo (where we had dinner reservations as well). If I ever come back to Mazara, I'd like to visit the Museo del Satiro Danzante, dedicated to the Greek bronze sculputure (about 25 centuries old), discovered by the fishermen's boat at the sea bottom near Sicilian island of Pantelleria. 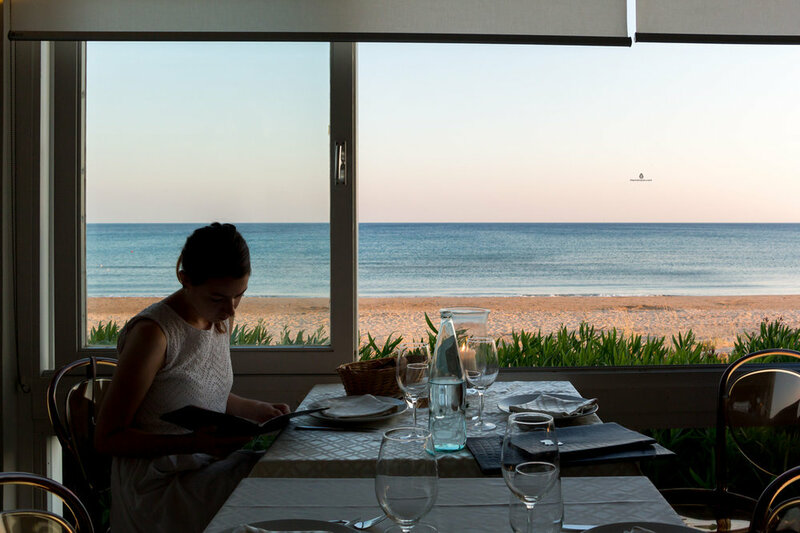 Restaurant Da Vittorio is situated right on the long sandy beach of Porto Palo, and since it was the hottest day, a swim in its shallow, but still refreshing waters was just what we needed. In the first video we made about our trip to Sicily, there are a few scenes from that beach included, in its all golden hour glory. We heard about Da Vittorio restaurant in our favorite travel documentaries Sicily Unpacked, presented by Italian chef Giorgio Locatelli and British art historian Andrew Graham-Dixon (seriously, if you haven't seen it, it's really worth watching). Giorgio Locatelli said in the series that it was his favorite restaurant in the world (! ), and we were ready to take his word for it. The food was divine, opulent, incredibly flavoured, the Sicilian way. We had an octopus broth, spaghetti with frutti di mare, then fritto misto di pesce (fried fish, shrimps and squid) and a dessert. Needless to say, we ordered way too much and couldn't finish it all. Chef Vittorio is a real star in his restaurant, navigating from table to table, chatting with regular guests, enjoying the atmosphere he created. We were seated by the window, with a view of the beach, agave flowers and sunset colours. It was exactly what we came to Sicily for. Next day we left Marsala and headed to the island of Marettimo, where we were to spend the next three days. But before discovering the most beautiful island we've ever been to, we first had a couple of hours in the port town of Trapani, from where we took a speedboat to the island. I read some not overly enthusiastic descriptions of Trapani in my guidebook, but actually ended up quite liking the city. The regular street layout with a wide pedestrian area and lavishly decorated Baroque buildings reminded me of Marsala, and there was that fresh sea-breeze as well. Only Trapani had more of a bigger city feel, with its fancy shops and more tourists that come along with it. We sat in a bar lured in by freshly pressed pomegranate juice, that crimson colour bursting on the side of the street was just so irresistible! It was also a good spot to observe the passers-by and the Sicilians in their daily routine. 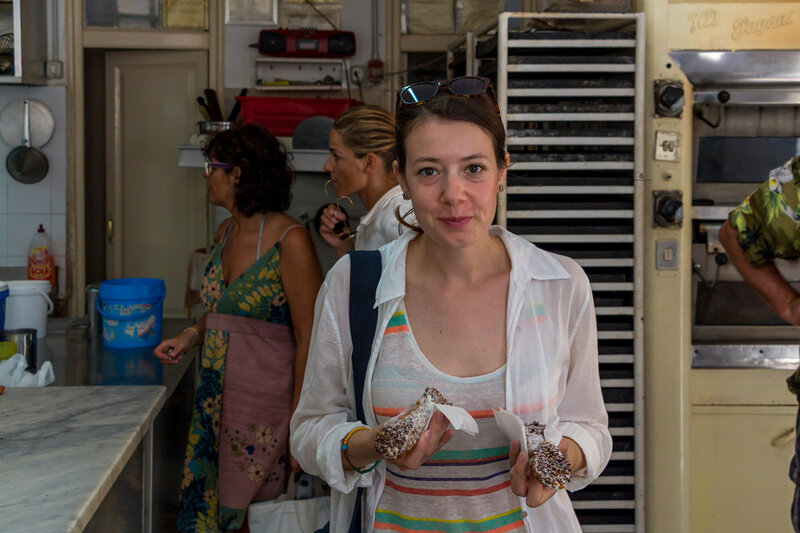 Apparently, there was a pastry shop that made the best cannoli (ricotta filled crispy pastry, sometimes dipped into nuts or chocolate, and one of the iconic Sicilian foods) on the entire island, so we had to make sure that it really did. The name Antico Laboratorio di pasticceria La Rinascente already sounded intriguing. We didn't expect that we'd walk straight into the workshop were the cannoli were made, and have a little insight into the process. Simple, old-school interior, a cashier, and two cannolis made on the site freshly for us were such a Sicilian experience. They were delicious, but Luka (a real sweet tooth and I'd say a cannoli tasting expert), proclaimed that the ones from Marsala were the best he ever tried. Who am I to argue?